For workloads that already use, or plan on using, MySQL or PostgreSQL, Aurora is our new go-to favorite deployment option for projects on AWS. The best use cases for Aurora will be substantial workloads that are well-suited to the simple scaling controls (both from an instance type perspective, as well as storage perspective), and will benefit from Aurora's simple, very low latency read replicas. Aurora is extremely fault tolerant and has improved self-healing ability. Automated maintenance for upgrades is by far the most superior feature of Amazon Aurora. Never be behind on upgrades again! Performance improvements for poorly structured schema due to enhancements added by Amazon. Replication works flawlessly due to added security measures added into Amazon Aurora which prevents admin users from "accidentally" breaking the slave instance. Amazon Aurora is hosted on Amazon's RDBMS which also includes quick and easy setup of new database instances. Connection to other legacy systems, ERP, CRM. Support for additional engines: Right now, Aurora is limited to MySQL and PostgreSQL. PostgreSQL-specific Instance Types: The PostgreSQL has high minimum instance type variants; while MySQL can take advantage of t3 instances, the minimum PostgreSQL instance is too large for lower-budget workflows and tests/debugging. There is only one business data model. Even if deploying new processes does not require stopping the platform, the BDM update requires it. During the platform evolution often new bugs were introduced so it was risky to deploy the platform in the low minor version. For example, there were memory leaks from 7.2.0 to 7.2.3. The administrator portal could be improved. It is hard to look at subprocess data, for example and it is sometimes better to investigate with SQL queries. I don't like new (7.3) task list either. Engine itself is efficient enough for most cases I dealt with. It can also be extended by clustering. I have done performance tests with JMeter and only managed to induce the crash of... JMeter. If there are efficiency issues they usually concern bad design/implementation of created apps or bottlenecks in integrated systems. Although I have met two cases with efficiency loss. 1. Java 7 related PermGen saturation caused by big number of installed apps (there is no jar dependency reusal between apps option). 2. Big number of waiting event handlers in processes stresses the database. It is better implemented with in-house expertise. In the end, we went with Amazon Aurora due to the decent performance and cost. Cost was determined in two ways for us: 1) no additional license is required (such as using SQL Server or Oracle) and 2) the ability to cut down on needed resources to maintain the system from the maintenance perspective due to the built-in maintenance capabilities. Amazon Aurora is also based on MySQL (soon to include PostgreSQL ) which allowed my team to quickly and easily move our existing MySQL servers to a faster system. Bonita BPM does have some nice visual tools. The annual maintenance is not so high and we particularly liked the visual tool to create business rules. Bonitasoft’s color-coded tools make life a bit simpler and more memorable for beginners or non-coder people. 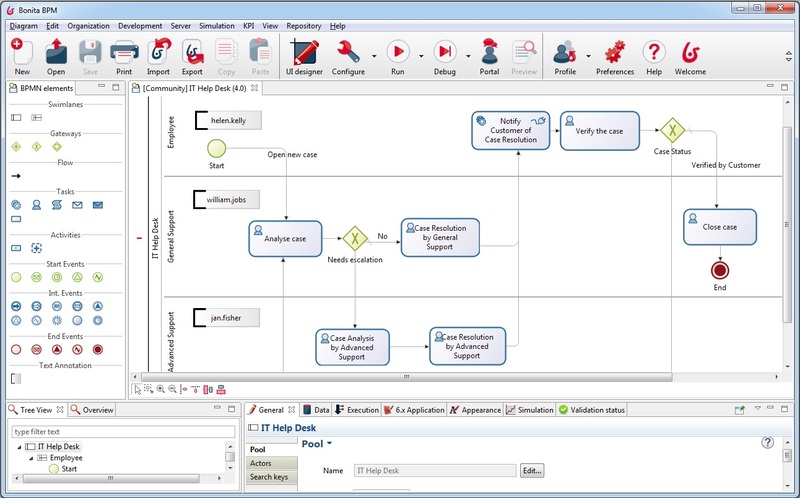 We really like Bonitasoft’s color-coded tools for creating rules. Has enabled us to not pay for over provisioned database storage that we may or may not need thanks to auto-scaling features. Per-second replica ability gives us peace of mind. Business processes are now more transparent to the users as Bonita allowed us to integrate the data from multiple systems in one place, so decision making is now easier. Process auditing is now straightforward based on the reporting features of Bonita.